When my band Green Day released our album American Idiot almost 13 years ago, we knew we were lobbing a grenade into the lap of the culture. With the fallout from 9/11 and the Iraq War revealing deep divisions in American society, our confrontational lyrics and attitude clearly touched a nerve, if our 15 million records sold are any indication. But now that enough time has passed to let the dust and controversy settle, I finally feel comfortable revealing that the “American Idiot” I sang about was none other than President George W. Bush. Don’t believe me? Go take a listen to “American Idiot” with this new info in mind, and I think you’ll find it all starts to finally click. I like to think that the song, and the album as a whole, takes on new meaning with that final piece in place. When I sang, “Information age of hysteria / It’s calling out to idiot America,” I wasn’t just calling out America in general—I was calling out President Bush’s America. The “alien nation, where everything isn’t meant to be okay” wasn’t just some frightening hypothetical: It was our own country! And when I sang, “‘Sieg heil’ to the president gas man” on “Holiday” later in the album, keen-eared listeners might rightly suspect that I was once again referring to George Bush. Not very kindly, I might add! It feels good to finally be able to go public with this: Yes, George W. Bush was the “American Idiot,” and no, I still don’t want to be him. So, why not just come out and say so back when the album came out in 2004? Tré Cool, Mike Dirnt, and I—the “Green Day Three”–discussed it intensely at the time. We decided it would be too shocking to name President Bush on our album directly, so we obscured our true intentions behind inscrutable lines like “I’m not a part of a redneck agenda / Now everybody do the propaganda / And sing along to the age of paranoia.” While we agreed that our fans deserved to know the whole truth eventually, we also believed it was just too much of a bombshell to drop into American consciousness at the time. Great art is often ahead of its time, but you can’t force the public to be ready for it. The main reason we made George W. Bush the “American Idiot” is because he started a war. Ultimately, we trusted our fans to think for themselves. Did I keep things too vague to really stick it to the man behind the desk? Perhaps. But I hoped that listeners would still subconsciously make the association between “Pulverize the Eiffel towers / Who criticize your government” and George W. Bush’s contentious relationship with France over the Iraq War, even if they never fully understood the connection. Until now, that is. 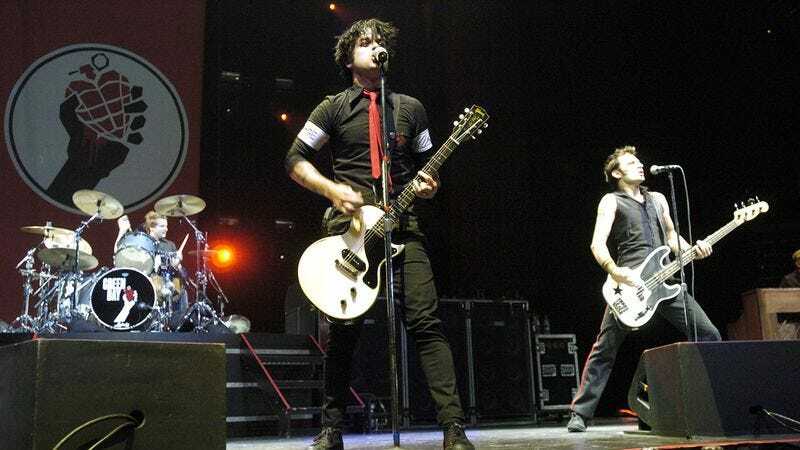 While Green Day’s lineup hasn’t changed since that day, a lot of other things in America have. History hasn’t been kind to Bush or his decision to invade Iraq. While our political climate is as charged as ever, that chapter, at least, is coming to a close. Thus, I can finally pull back the curtain on this little corner of Green Day lore, in hopes that our fans and critics alike might find some edification in it. But who knows? We’ve got a whole new dysfunctional administration in the White House. Maybe the saga of the “American Idiot” might not be as over and done with as it seems. Well, that’s it from me. Until next time, Greenheads!